Fate: Sold for scrap 18 DEC 1946 to Patapsco Scrap Co., Bethlehem, PA for the amount of $67,228. 72k Port Bow view. From the collection of Gerald M. Charpentier of New Orleans, LA. 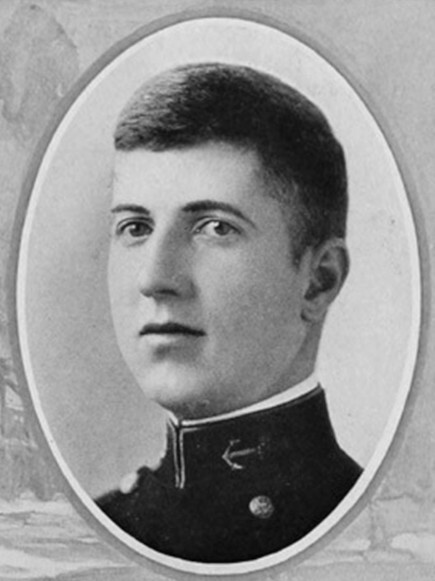 Donated by his niece, Elaine C. Witty-Charpentier. Elaine C. Witty-Charpentier. 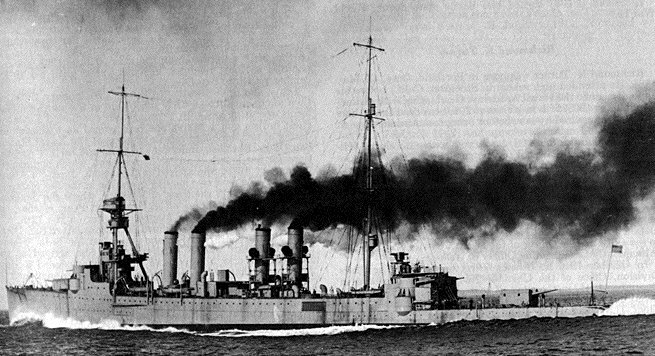 USS Richmond (CL 9) Steaming at high speed during her builders' trials, 1923. U.S. Naval Historical Center Photograph #NH 63573. 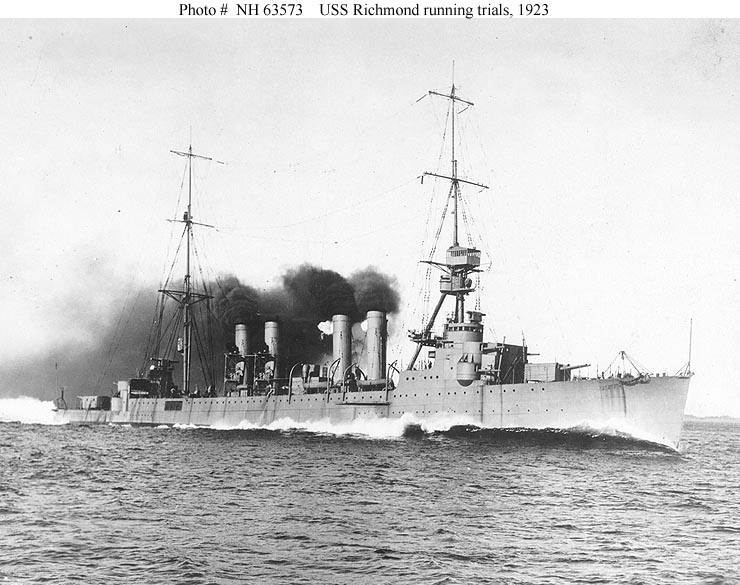 USS Richmond (CL 9) running at 32 1/2 knots during trial run No. 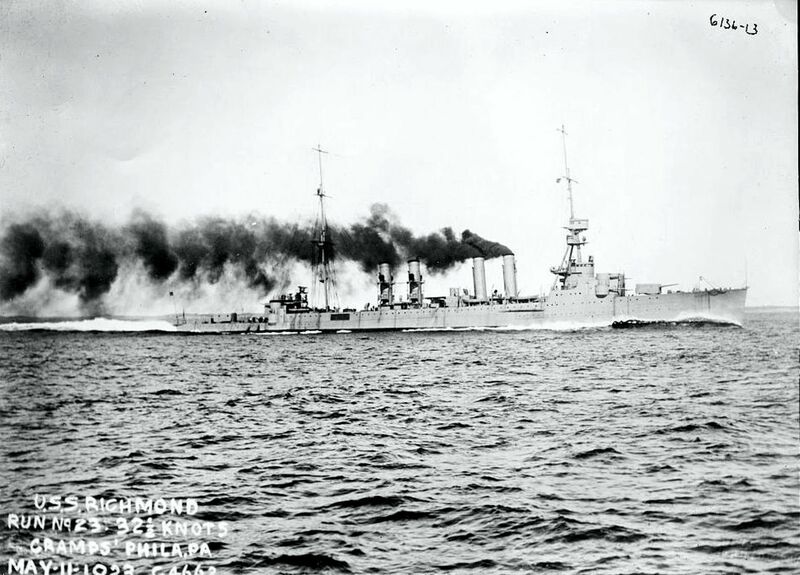 23 on 11 May 11 1923 off Philadelphia Navy Yard. 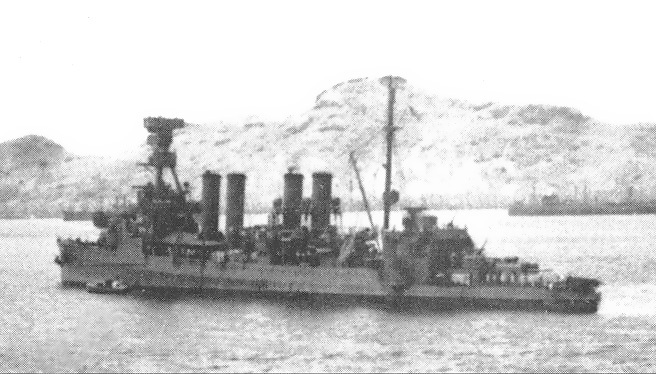 USS Richmond (CL 9) underway running trials on 11 May 1923, seven weeks before being commissioned. 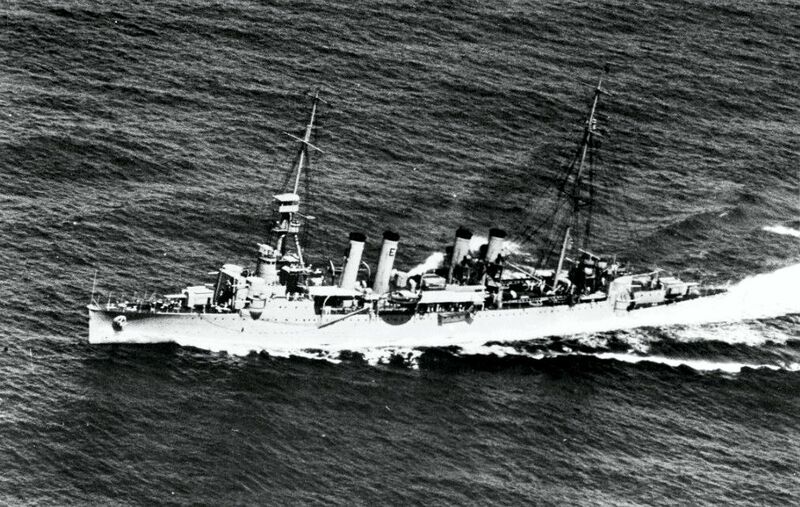 USS Richmond (CL 9) underway on 15 March 1927. 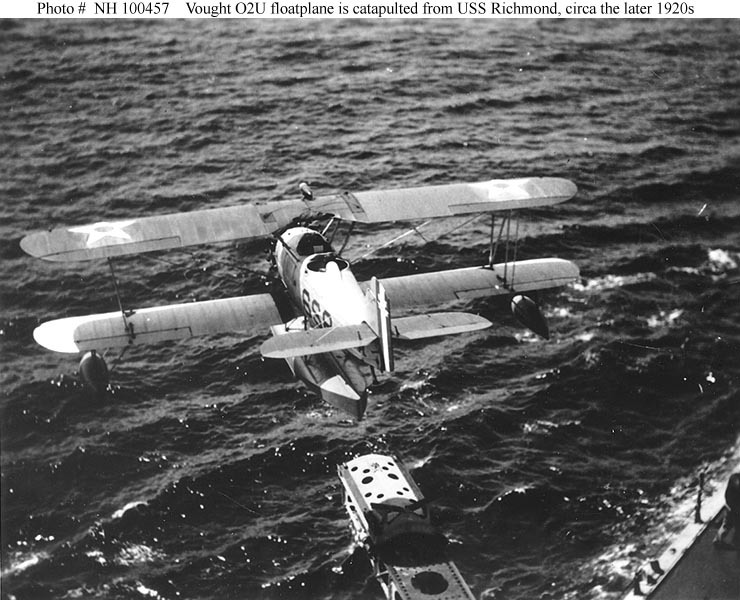 Vought O2U "Corsair" Floatplane, of Scouting Squadron Six Is catapulted from USS Richmond (CL 9), circa the later 1920s. 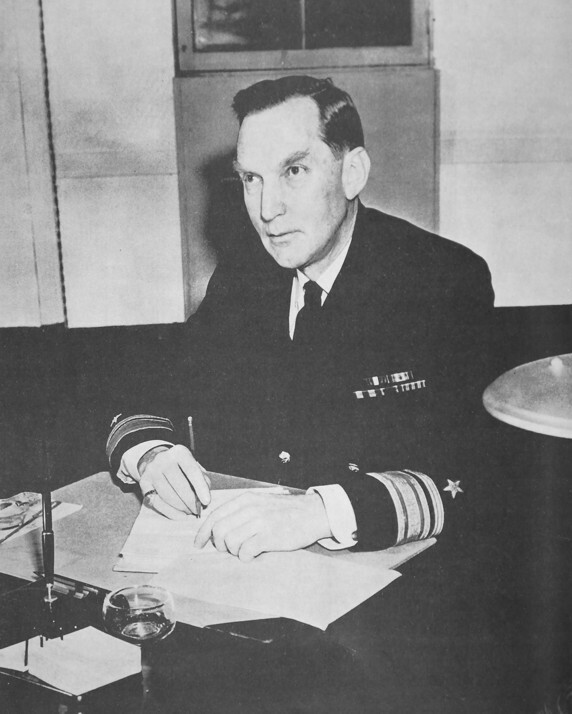 Collection of Vice Admiral Dixwell Ketcham. U.S. Naval Historical Center Photograph #NH 100457. 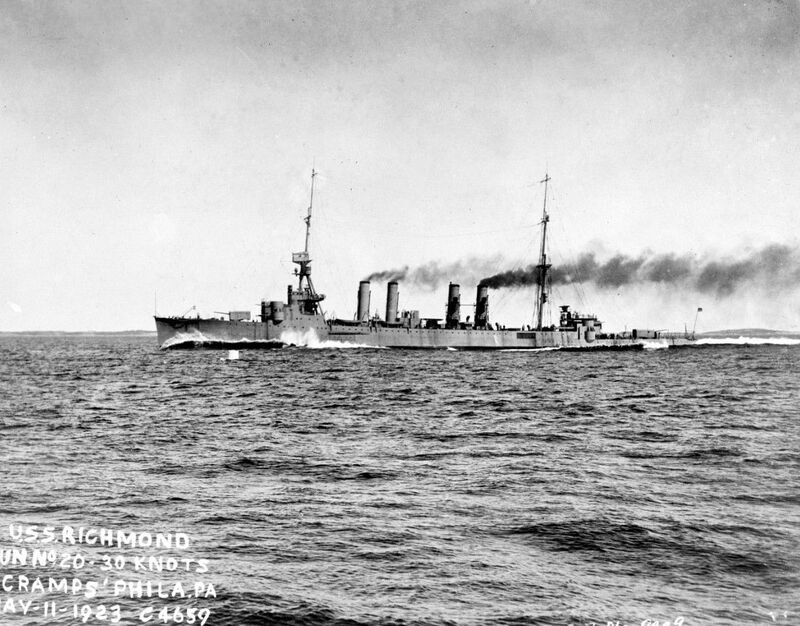 USS Richmond (CL 9) At anchor in a harbor, probably circa the later 1920s. 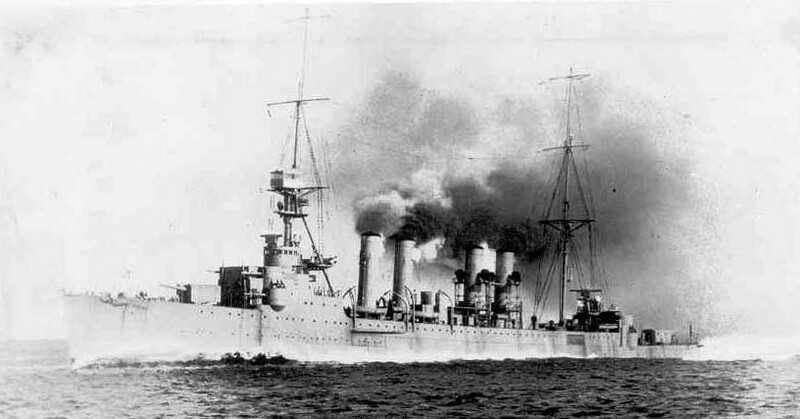 Note that the ship still carries twelve six-inch guns. The after lower casemate guns were removed sometime between 1929 and 1931. Donation of Franklin Moran, 1967. U.S. Naval Historical Center Photograph #NH 64631. 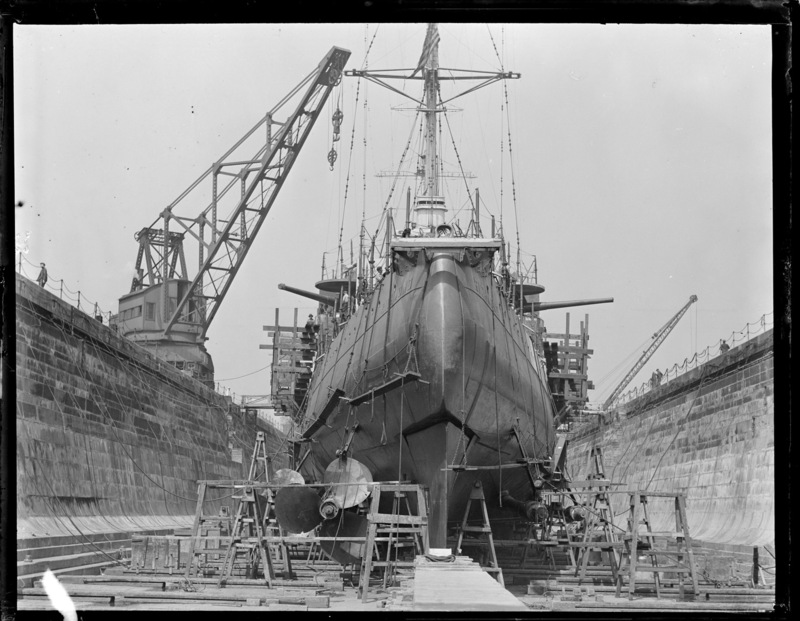 USS Richmond in Drydock at Boston Navy Yard, 21 April 1931. 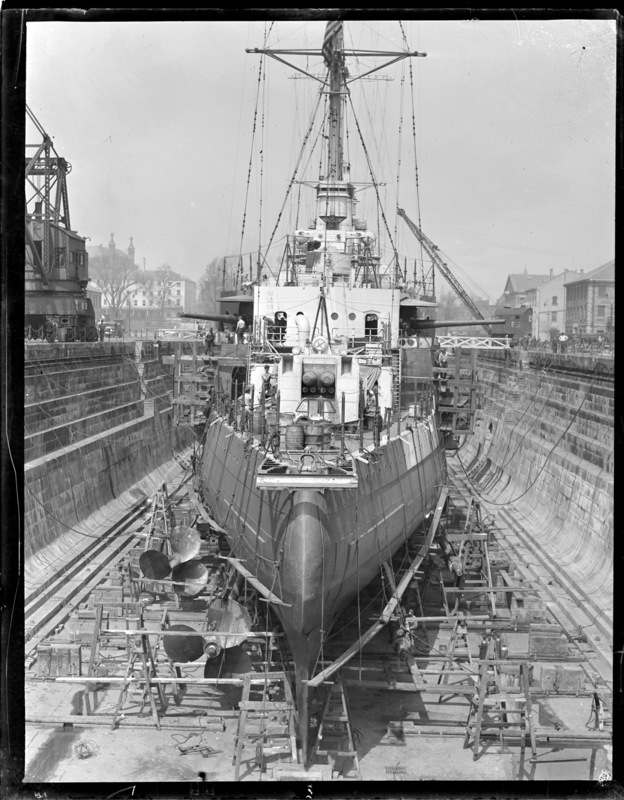 In this photo, note how far the screws protrude due to the shape of the stern. From the Leslie Jones Collection at the Boston Public Library. 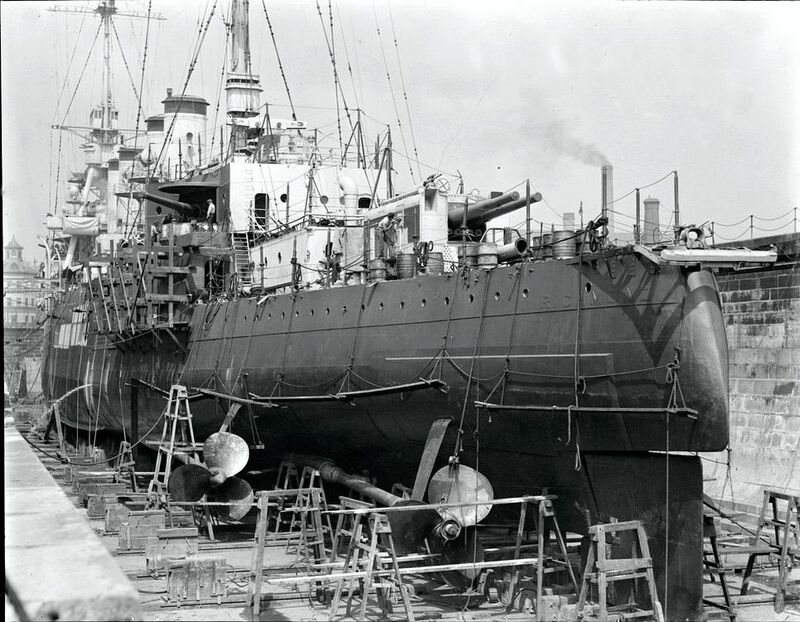 USS Richmond in Drydock at Boston Navy Yard, 21 April 1931. 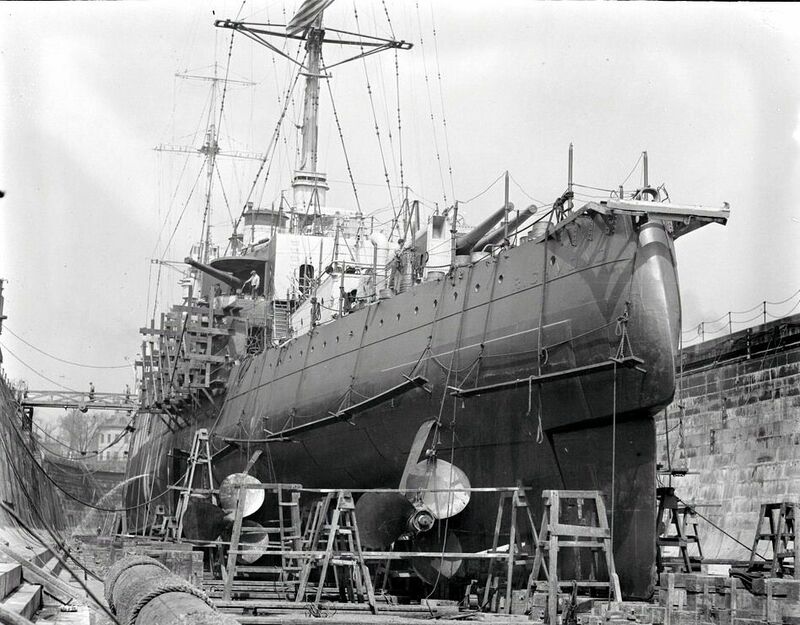 Port quarter view of USS Richmond (CL 9) in dry dock at Boston Navy Yard on 21 April 1931. Note that the after lower casemate guns have been removed . Boston Public Library, Leslie Jones Collection. 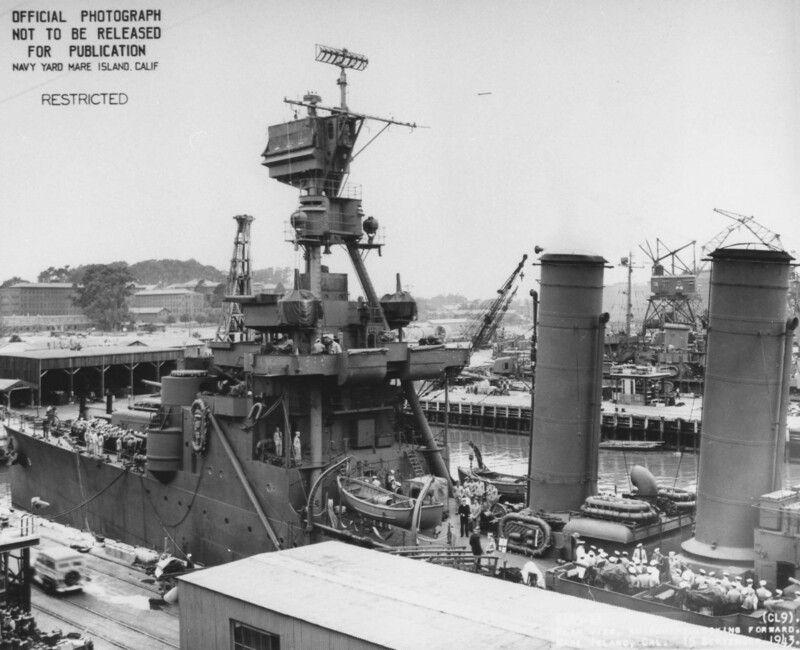 Close up port quarter view of USS Richmond (CL 9) in dry dock at Boston Navy Yard on 21 April 1931. Note that the after lower casemate guns have been removed . 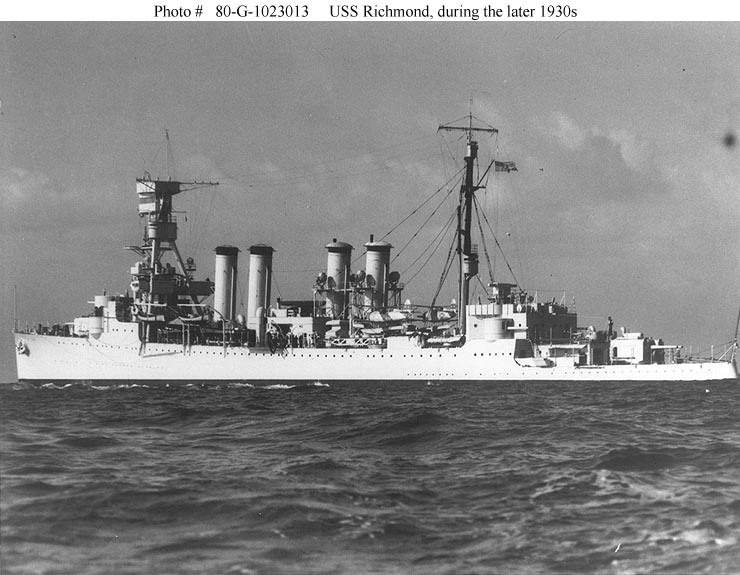 USS Richmond (CL 9) underway, during the later 1930s. Note that she is carrying SOC floatplanes. 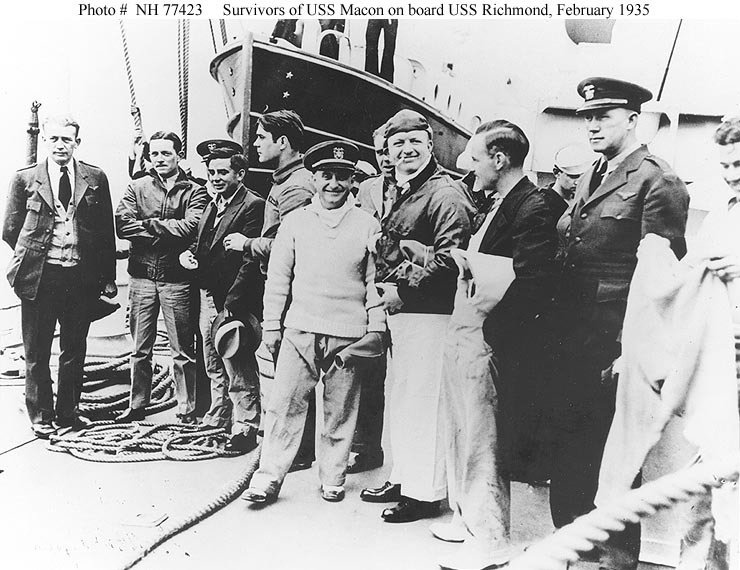 Some of USS Macon (ZRS 5) officers aboard USS Richmond (CL 9) on the morning after her crash. Macon went down during the night on 12 February 1935. Present are (left to right): Lieutenant (Junior Grade) George W. Campbell; Lieutenant (Junior Grade) Gerald L. Huff; Lieutenant Anthony L. Danis; Lieutenant Harold B. Miller; Lieutenant Commander George H. Mills; Lieutenant Commander Calvin M. Bolster, Construction Corps; Lieutenant (Junior Grade) Earl K. Van Swearingen; Lieutenant Howard N. Coulter; Chief Boatswain William A. Buckley; and Lieutenant (Junior Grade) Leroy C. Simpler. Courtesy of Harold B. Miller, 1973. Naval History & Heritage Command photo (# NH 77423). 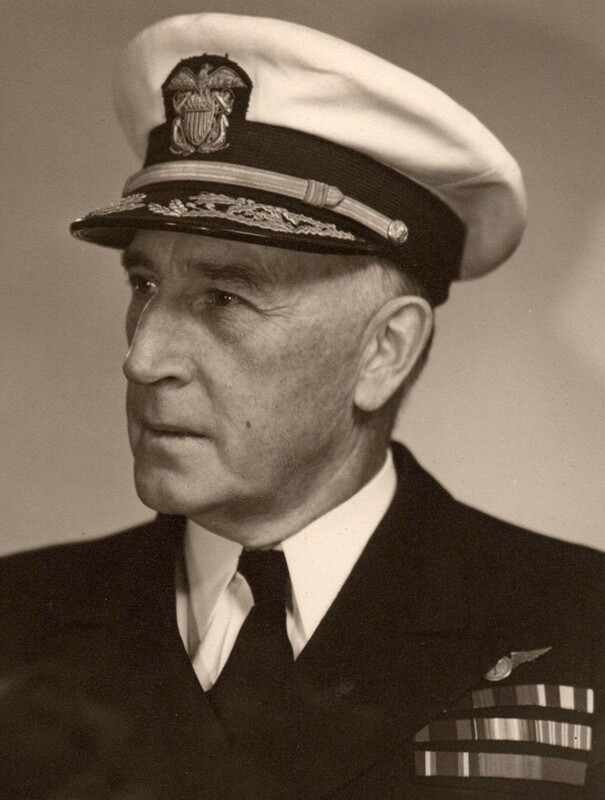 Official U.S. Navy Photograph, now in the collections of the National Archives #80-G-1023013. USS Richmond (CL 9) Plan view, forward, taken at the Mare Island Navy Yard, California, 15 September 1943. 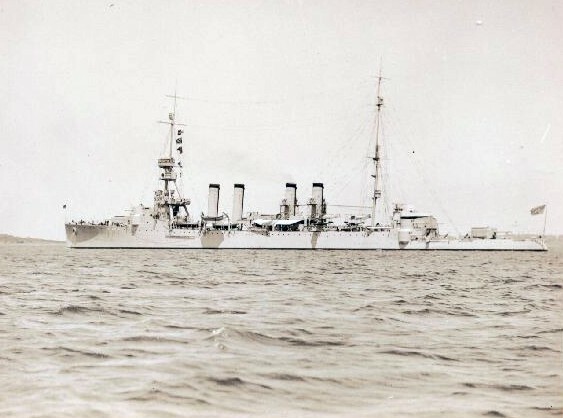 Note: crewmen in formation beside the forward 6"/53 gun turret; paravane on deck; life rafts; rangefinder; tripod foremast; FD and SG radar antennas at the masthead; and boat boom. USS Honolulu (CL 48) is in the background. 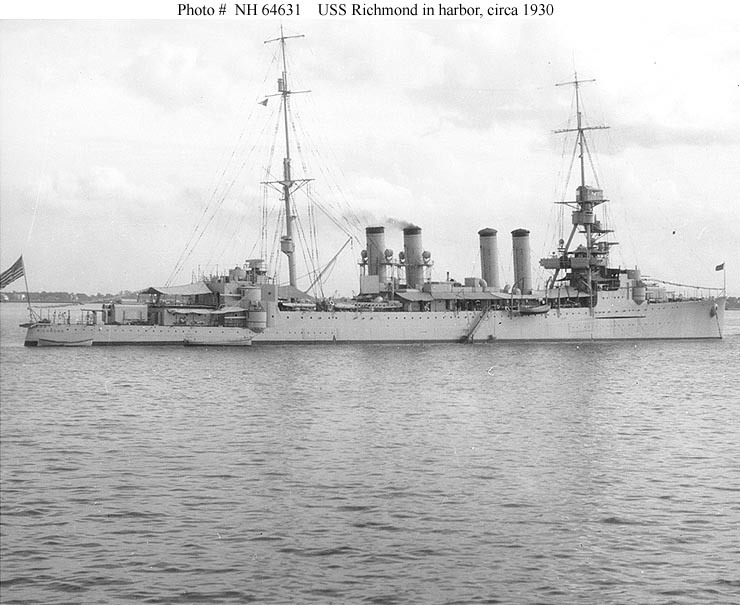 Photograph from the Bureau of Ships Collection in the U.S. National Archives #19-N-52426. 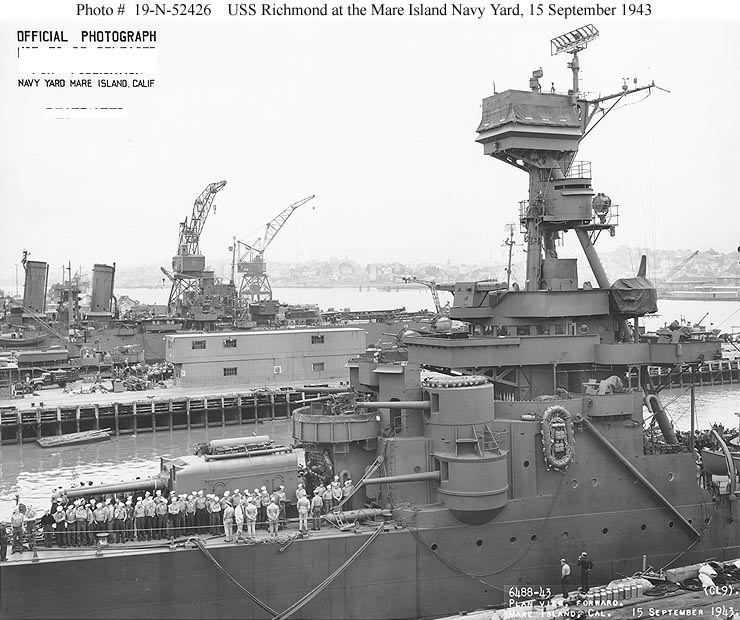 Amidships plan view looking forward of the USS Richmond (CL 9) at Mare Island on 15 September 1943. USS Richmond (CL 9) Plan view, aft, taken at the Mare Island Navy Yard, California, 15 September 1943. 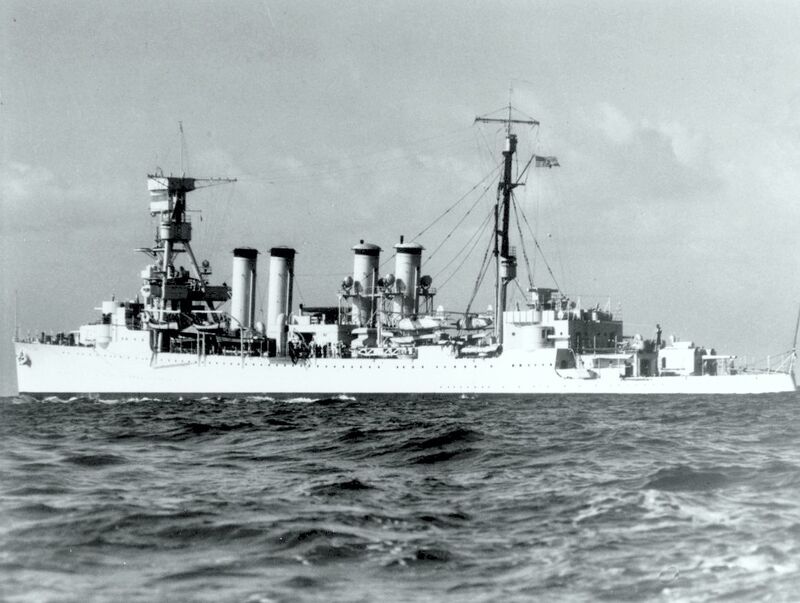 Note: triple torpedo tubes, with a loading practice machine for 6"/53 guns on deck between them; 40mm twin gun mounts on the centerline of the after superstructure; and life rafts. Among the barges in the distance are YOS 1; YF 390 and YF 466. 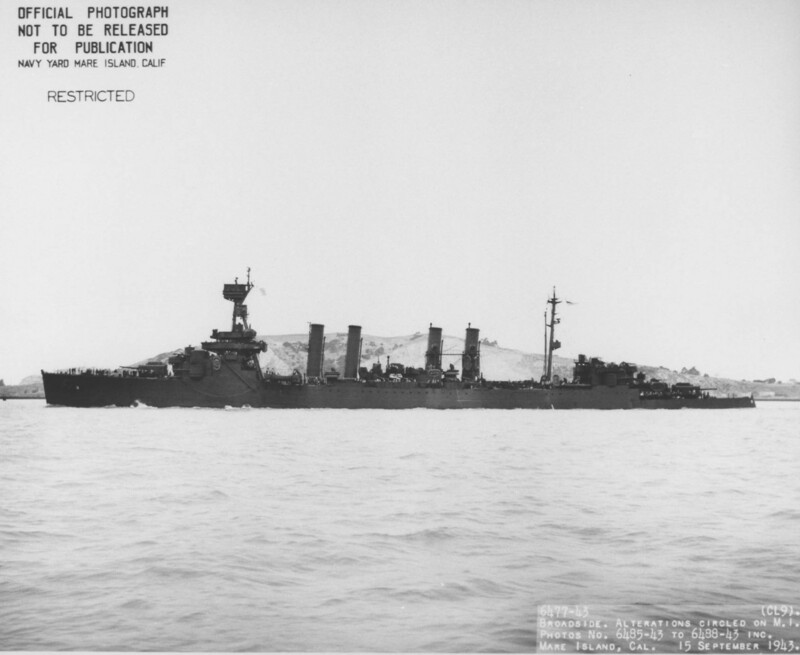 Photograph from the Bureau of Ships Collection in the U.S. National Archives #19-N-52427. 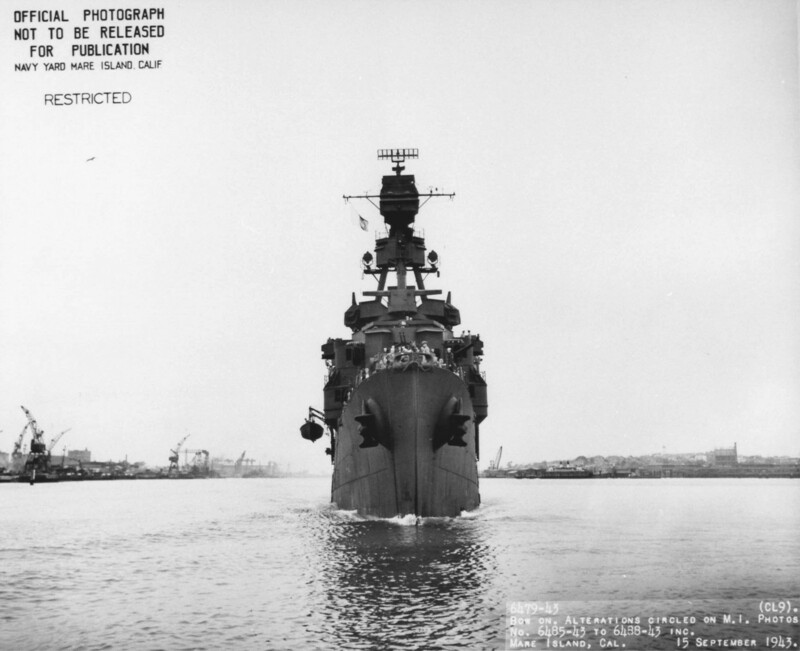 Port bow view while underway off Mare Island Navy Yard, 15 September 1943. 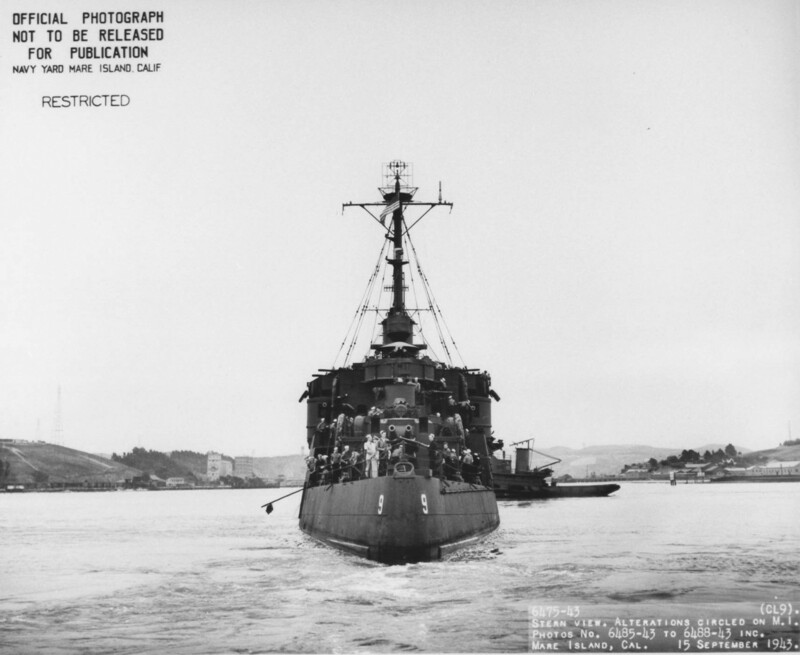 Stern view of the USS Richmond (CL 9) departing Mare Island on 15 September 1943. 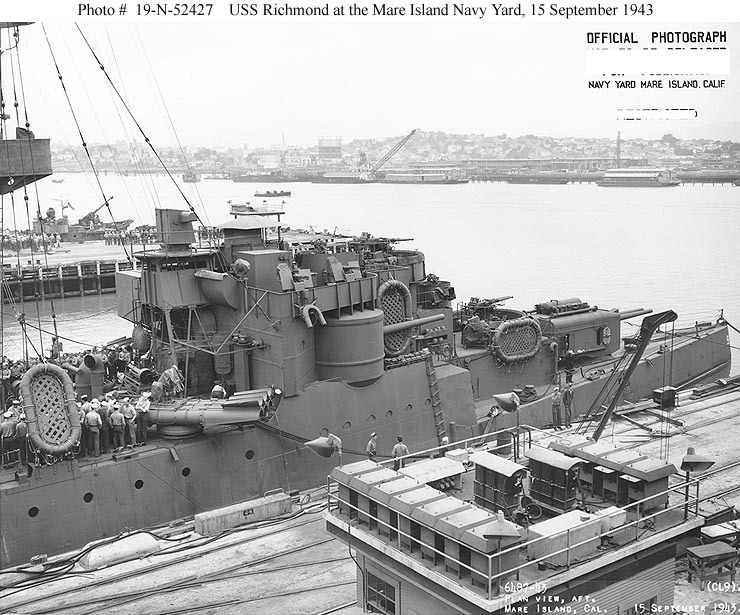 USS Richmond (CL 9) Off the Mare Island Navy Yard, California, 15 September 1943. 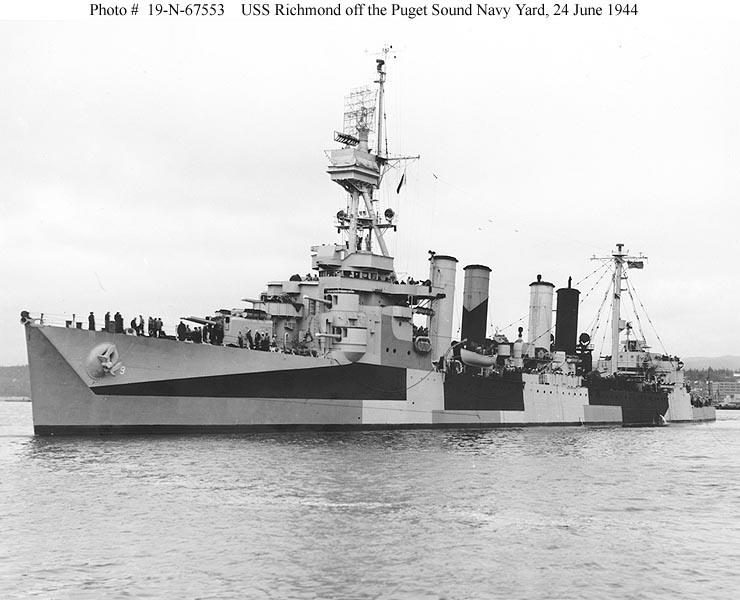 Bow on view of the USS Richmond (CL 9) off Mare Island on 15 September 1943. 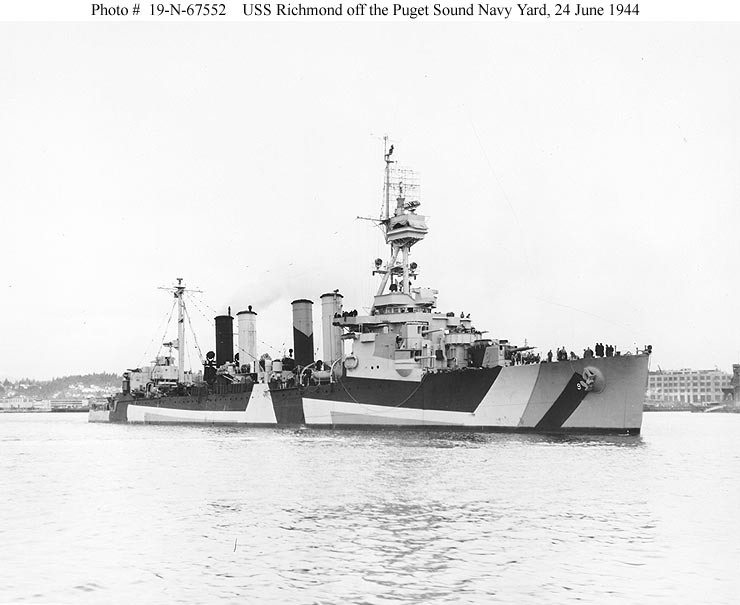 USS Richmond (CL 9) Off the Puget Sound Navy Yard, Bremerton, Washington, 24 June 1944. Her camouflage is Measure 32, Design 3d. 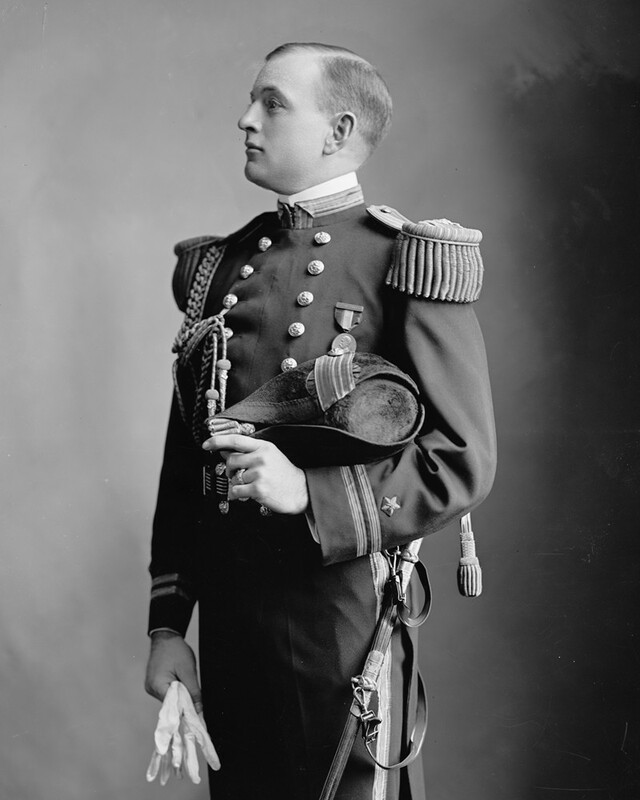 Photograph from the Bureau of Ships Collection in the U.S. National Archives #19-N-67552. 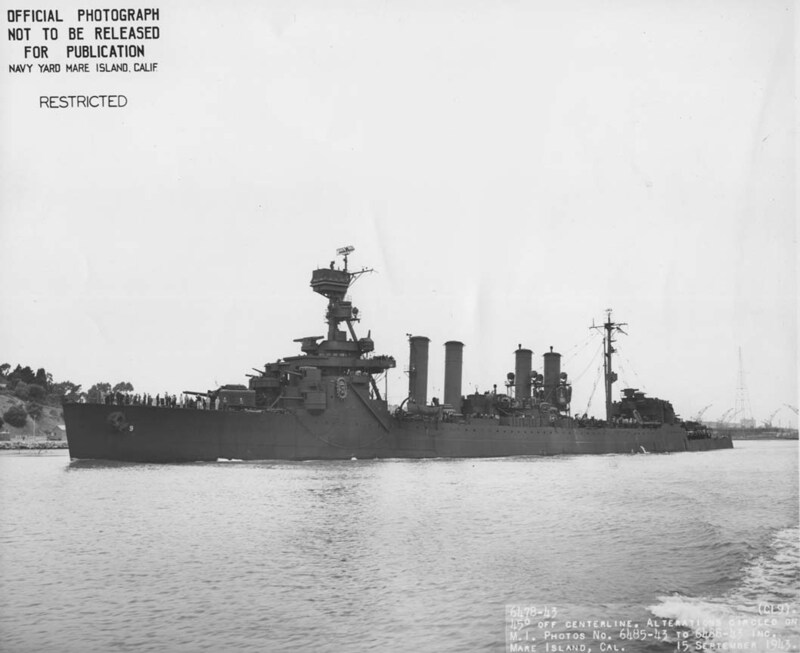 Photograph from the Bureau of Ships Collection in the U.S. National Archives #19-N-67553. 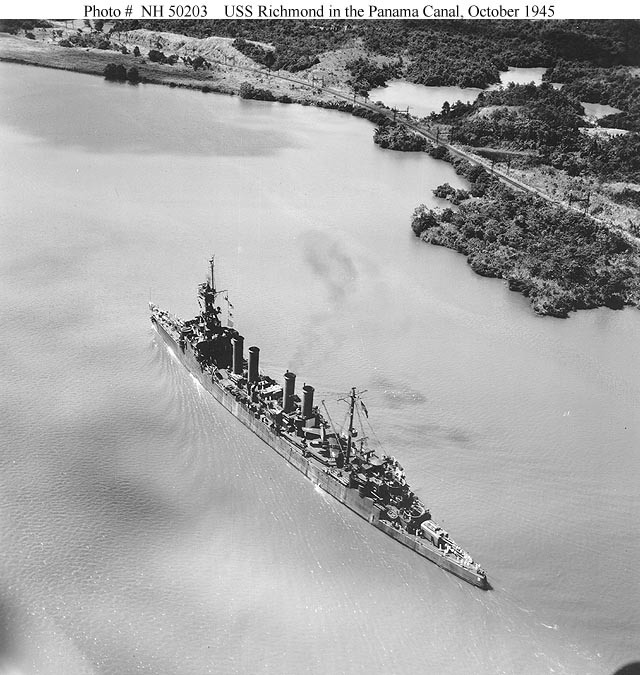 USS Richmond (CL 9) In Gatun Lake, Panama Canal, on 11 October 1945. Official U.S. Navy Photograph, from the collections of the Naval Historical Center #NH 50203.